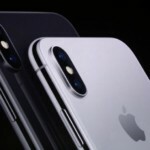 Last fall, ahead of the launch of iPhone X (which many assumed would be called iPhone 8), colours of Apple’s latest smartphone were popping up on the web, in the form of dummy models. One alleged colour which stood out from white and black was the unique ‘blush gold’. Just because ‘Blush Gold’ shows up on Twitter does not mean it’s real, of course. 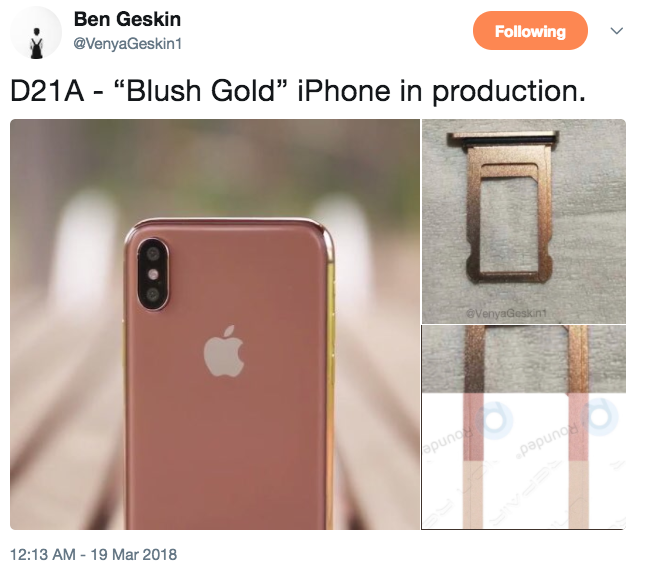 Last year Geskin similarly posted the model was coming, claiming “Foxconn’s internal name of the new #iPhone8 color is “Blush Gold” Barcode says “Blush Gold 64GB / 128GB”. Apple has a March special event upcoming, an education-themed ‘field trip’ set to take place in Chicago, Illinois. During last year around this time, Apple unveiled a (PRODUCT)RED iPhone 7 and iPhone 7 Plus—could we see a similar announcement for a new iPhone colour this spring? Would you like to see a ‘blush gold’ iPhone X colour option?